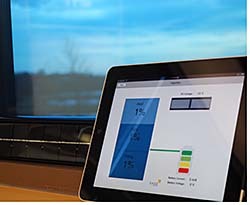 SageGlass Simplicity has a thin strip of solar photovoltaics at the bottom or on the side of each pane to power tinting throughout the day. Also has a low-profile electronic controller for wireless communication, and battery back-up for up to two days. On-demand tinting and control is done via iPad app.